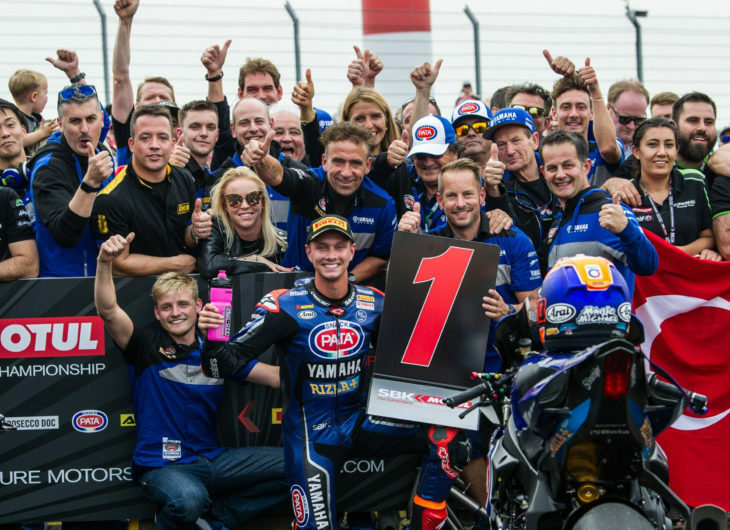 Yamaha’s Michael van der Mark not only won his first ever WSB race this weekend at Donington, he took the wins on both Saturday and Sunday! Threatening to break the dominance of Kawasaki, and Jonathan Rea in particular, van der Mark stormed through the field in Race 2 from his grid penalty position of ninth, at one point re-passing Rea and pulling away. Podium spots in Race 1 went to Kawasaki factory riders Rea and Tom Sykes behind Van der Mark, while Race 2 saw the maiden podium from Toprak Razgatlioglu (Kawasaki) followed by Rea in third. Rea continues to enjoy a large points lead in the championship. You will find full results to Race 1 here, and Race 2 here. For additional details and points, visit the official WSB site. Maybe the next Ben Spies. Don’t leave yammy too early. Partnering with rea is not always the best decision. You are the lead rider at Yamaha now. What a refreshing result. That kid was immediately fast when he arrived in wsbk. Good to see him finally put it all together. Hopefully it’s the start of many more. Someone has to step up to the Kawasaki’s. Lad done good. Good to see another manufacturer challenging Kawasaki and Ducati for wins.